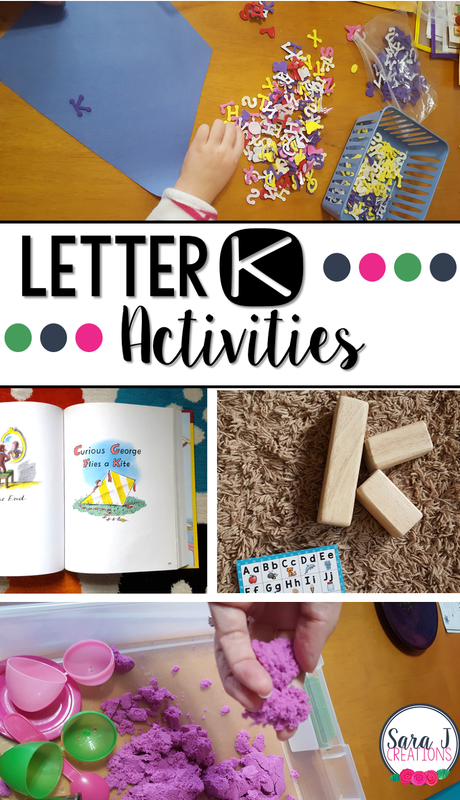 Preview: Letter K Activities that would be perfect for preschool or kindergarten. Art, fine motor, literacy and alphabet practice all rolled into Letter K fun. This week in our weekly alphabet study is the letter K activities. We had some handwriting practice, literacy fun, an art project, craft, sensory fun and a review of all the letters we've learned. To start our study of the letter K and a week of fun activities, we read the book Curious George Flies a Kite by H.A. Rey. We talked about how the word kite starts with K. Then I showed my daughter what a K looked like in the book and we searched for other K's. This was an easy one with upper and lowercase K looking the same. I made sure to pick a book that matched the picture that we would create next for our alphabet art book. For the alphabet book we are working on, we added K is for Kite. My little one asked for Kwik Stix paint sticks and went to town coloring in the kite. The alphabet book is part of my Alphabet Centers with Real Pictures. To practice writing the letter K, I put our alphabet tracing sheets in a reusable plastic sleeve and gave her a dry erase marker. She loves tracing them, but rarely will attempt to make the letter by herself so I was excited that she at least attempted it this week. We practiced identifying the letter K in all different fonts with our K page from our Alphabet Centers pack. We used our favorite dot marker this week and she worked on this while I set up the next activity. Next up we made a kite craft. I cut a kite out of construction paper. Then I gave her lots of foam stickers. I told her to find the letter K, peel off the back and stick it to the kite. Then we put a ribbon on the bottom as a tail. For a sensory bin we pulled out our purple kinetic sand. We talked about how kinetic starts with a k and what that means and why it is different than regular sand. If you've never played with this stuff, you need to check it out. It is so much fun. It is like a sand and silly putty hybrid. It feels like sand but it can drip out of your hands. It sticks together better so while it can still make a mess like sand, it is usually in clumps instead of individual grains of sand. To review the letters we've covered so far, we got out our big wood blocks and our FREE alphabet chart. We practiced making letters using the blocks. Then we used our puzzles from our alphabet centers and practiced matching upper and lowercase letters. She still struggled with letters that look nothing alike but did okay with letters that look similar and letters we've practiced so far.